Rocky I'm thinking it's some fluke in ohio weather. My brakes are acting the same way and I put new pads on about 300 miles ago and the pedal was fine. Now it's getting spongey and I really have to push the pedal far to stop. I'm actually in the process of changing the rear shoes and cleaning everything up. Then I'm going to bleed the whole system in hopes to get regular braking back. Well I had a bigger problem than what I thought. On to the pics. 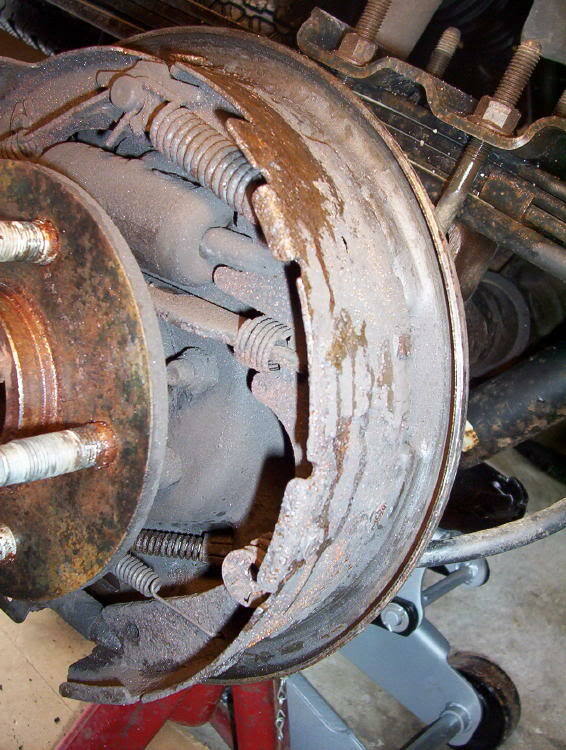 Is that the brake shoe stuck to the drum??!! It's not stuck well, it wasn't. They rusted together overnight because I limped it home in the rain. I pulled it off and then cleaned up the drum. 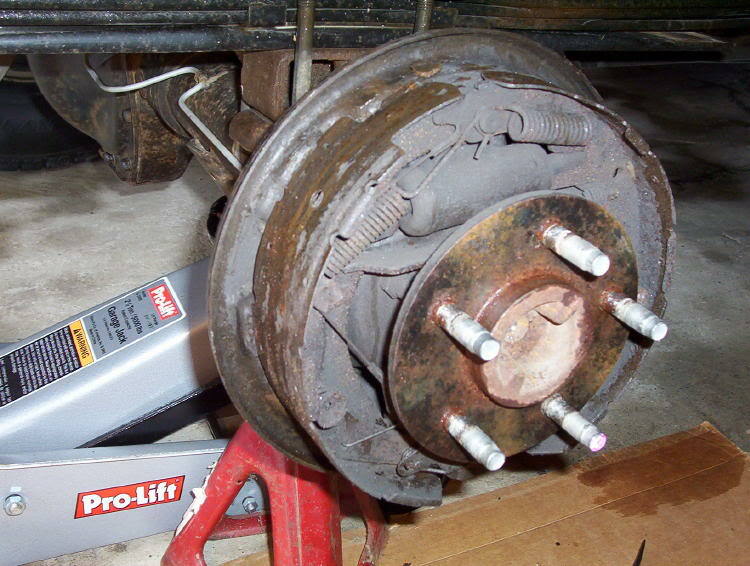 Well, either way, it is supposed to attached to the brake, not floating around to ruste to the drum. I'd say you found the root of your problem. This is a common problem. Rwenzinger had a simular event, It happened to me 3 times ( I'm in the snowbelf of Buffalo here ). 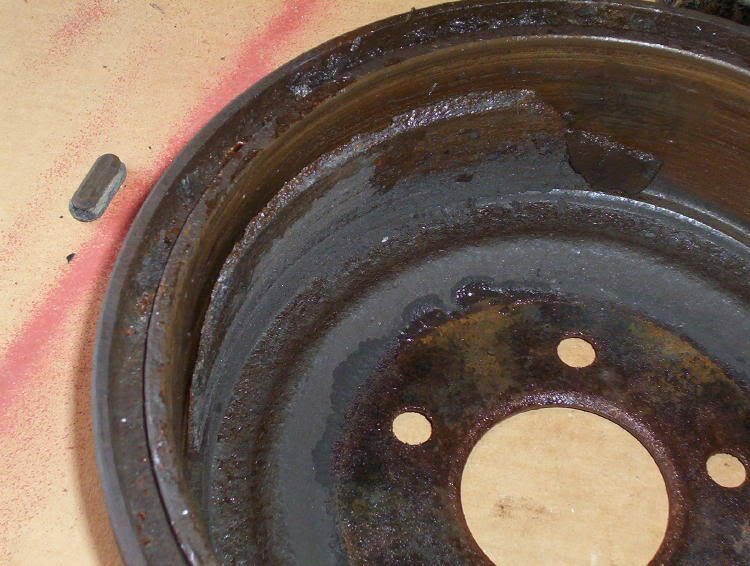 Theres a common issue with the rear drums lockign and rusting in cold/damp weather. Condensation gets into the drums.. and its ' over '. This happened even after I changed to bendix pads. RayBestos aren't any better.. Still happened. I have pics of mine that look simular to yours but I had to ( literally ) take a 30lb sledge to get one of them off and an air chizel to get the other side. I made a jerry-rigged gear puller from a 2x4 and some metal I had laying around. It kinda loosened the drum up then I had to wiggle them around to get them off. I had my ebrake stick on the drivers side and it got up to about 550degrees too woot. if my efan wiring is burning(was 2nd day of efan). Got to my dads and the Wheel was about 200degrees... drum was 550 at hottest spot. Im doin an axle swap...I just got the explorer axle today...I've been running with destroyed drums for the past 2 months...no pads, broken springs...all f*cked up...so I've been goin through front disk pads like...every 2 months hahah...been to lazy to put breaks in the back..but now Im gettin round to it..swapping axles to get disk breaks, Ill take pics of my drums for ya soon..
My main clue as far as noise.. It made the same sound as bad universal joints on a driveshaft. Whenever I pushed in my clutch while rolling.. ' thump '. I will have the guy doing my brakes on saturday check it out. but its weird because it comes from the right rear. cb whip antenna messing up radio reception?